In light of the recent financial crisis and changing economic landscape, McNamara and Williamson present and analyze the possibility of working longer. Including a range of potential policies (e.g., further increasing the age of eligibility for full Social Security benefits, allocating more government resources to retraining and job search assistance for older workers), this is one of the major approaches currently being discussed by policy analysts inside and outside of the government. 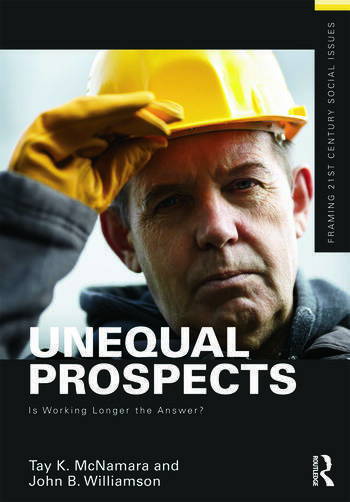 Emphasizing the role of inequalities and diversity among older adults, this book provides a framework for thinking about the advantages and disadvantages of working past the current retirement age. This book is for Sociology of Aging, Social Inequalities, and Social Problems courses. Tay K. McNamara is a senior research associate at the Sloan Center on Aging & Work at Boston College. Her B.A. is from Saint Anselm College, and her Ph.D. in sociology is from Boston College. She is the author or co-author of academic articles on a range of topics related to older workers, such as employer-provided flexible work practices, training of older workers, working in retirement, and volunteerism among older adults. These articles have been cross-disciplinary, written for academic audiences in disciplines sharing an interest in aging and work, including gerontology, industrial relations, and human resource management. Additionally, she is a contributor to or author of a number of reports designed to help the media, human resource managers, and other non-academic audiences to understand the results of current research on aging and work. She has also been a speaker or presenter at webinars and presentations aiming to address the practical implications of these research findings for employer audiences. John B. Williamson is currently a Professor in the Department of Sociology at Boston College. He is also affiliated with the Center for Retirement Research and the Sloan Center on Aging and Work, both at Boston College. His B.S. degree is from MIT and his Ph.D. is from Harvard University. He co-authored or co-edited 16 books many of which deal with aging issues including two that are gerontology textbooks. He has also authored or co-authored about 140 book chapters and journal articles many of which deal with aging related issues such as older workers, retirement, Social Security population aging, and old age security policy in various countries around the world. He was recently the Chair of the Social Research, Policy, and Practice Section (which made him also a vice president) of the Gerontological Society of America. He is currently an associate editor of The Gerontologist and on the editorial board of five other journals.